A graduate of Newcastle University, Parling became a regular with the Falcons in the 2005-06 season. The lock skippered the Falcons a season later, but left the northeast side for Leicester at the beginning of the 2009-10 season. During his first season with the Tigers he caught the attention of England coach Martin Johnson, who selected him to tour Australia that summer. He was made to wait almost two years for a first cap however, having been drafted in under the new leadership of Stuart Lancaster. During the Six Nations in 2012 Parling proved his worth as a lineout forward and became first choice in time for that year's summer trip to South Africa. 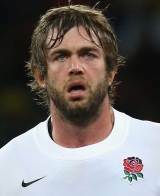 Parling continued to be an automatic selection and England's lineout leader during their autumn internationals in 2012, which included victory over New Zealand, and the 2013 Six Nations campaign, which saw them finish second to Wales. The Leicester Tigers second-row was then selected as part of Warren Gatland's Lions squad to tour Australia.